I have spent a lot of time living from April 11th, 2011 to March 20th, 2012. I’ve lived it once, twice, three times. I’ve turned over the events in my head, and I’ve filled in the gaps. I’ve watched other people live that year, and I’ve read about other people living that year. I’ve thought about going back and living it again. Persona Q: Shadow of the Labyrinth thinks I should move on. Not in a combative way, though. Persona Q is merely nudging me in a healthy direction, a supportive friend who understands my predicament better than I’m willing to admit. Plenty of art has attacked its audience, and only some of that art is successful on its own terms. This game isn’t so much an attack as it is a melancholy plea for change. 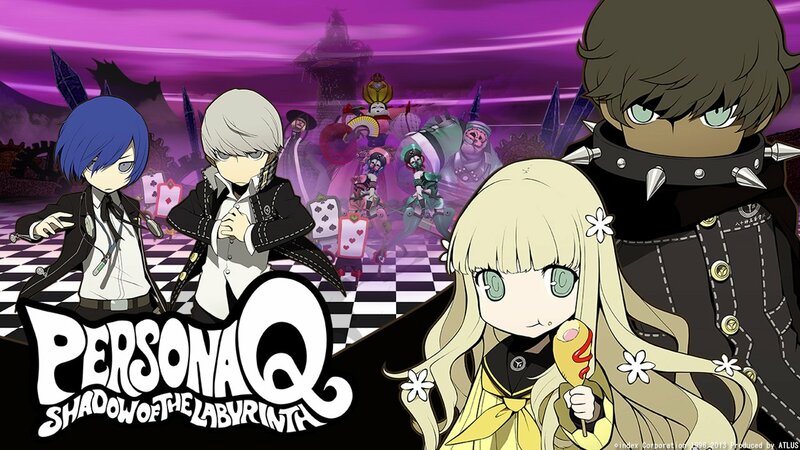 Persona Q could be much, much worse than it is. That game is extremely easy to imagine. This is a series all about characters growing and confronting themselves. How on earth could those themes be justified within a silly, fan service-focused romp? A lesser game would ask the player to just look the other way, but this game, this odd, beautiful game, is content to squirm around in its big questions until its knees buckle. Persona Q makes this fundamental contradiction its greatest asset. The characters from Persona 3 and 4 have found themselves ripped out of time and space — 2009, Port Island; 2011, Inaba — for reasons immediately unclear. The two casts need to work together to explore the faux-high school they seem to be trapped in, filled to the brim with mindless, cardboard students enjoying themselves at a Culture Festival. Dungeons are beginning to appear at some of the exhibits, and two new faces, Zen and Rei, have lost their memories. It’s a tantalizing set-up not because of the means, but the ends — at first, this feels like a ramshackle excuse to get Chie and Aigis in the same room. But as you keep progress, it becomes increasingly clear that Persona Q has more than just fan service on its mind. Not that it would even need to. Persona Q is Honorary Mayor Of Fan Service County, a satisfying and precise balancing act of aesthetics and delightfully geeky in-jokes. It’s pandering, but it’s never half-assed. Some real love went into even the lightest parts of the story. There’s a general commitment to excellence that’s deeply felt within every nook and cranny. And, sure, there are missteps. Some characters (I’m looking at you, Teddie) are driven thoroughly into the ground, while others just don’t quite get their time to shine. But the overall effect is so charming that it’s hard to stay angry at the weaker bits. To spend this much time on the story is a little misleading, because most of your time playing Persona Q will be spent in a dungeon. I’ll admit a level of ignorance here, because I’ve never played an Etrian Odyssey game — the series that Persona Q‘s gameplay specifically recalls. I don’t really know what’s new, or if anything’s new, so bear with me. 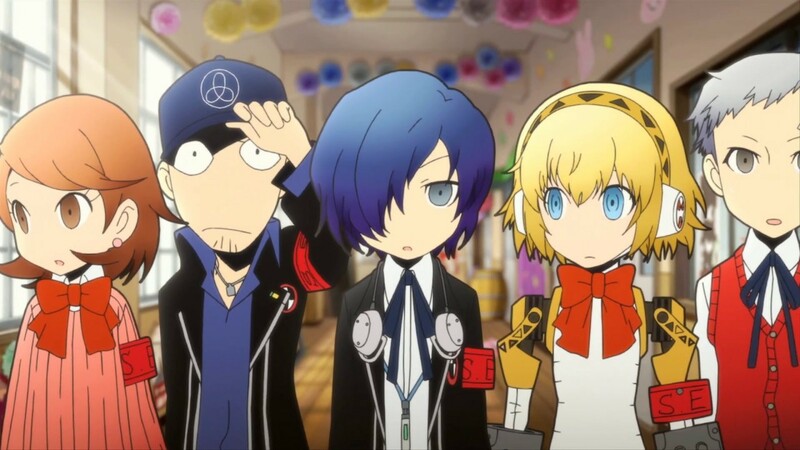 Persona Q is a slower, tougher game than Persona 3 or 4. It takes specific cues from those games’ battle systems, but shakes up the rhythms and strategies entirely. The previous foolproof victory method (exploit weaknesses, use All-Out Attack, repeat) is rendered obsolete. Now, exploiting an enemy’s weakness doesn’t necessarily knock them down. It instead activates the attacking party member’s “Boost Mode.” While you’re boosted, you’ll act first in the turn order, and all skill costs are nullified. If you’re hit, or if you fail to exploit another weakness, you’ll lose your boost. Describing JRPG battle mechanics can be tedious, so I’ll cut to the chase: the boost mechanic is pretty ingenious, and demands a level of awareness that most other games don’t. The rhythm of each fight is extremely variable based on the enemies you’re fighting, and even the default rhythm is quite unlike any other battle system I can recall (excepting, of course, that Etrian Odyssey is probably similar). Combat is only half the battle, though. Cartography is a huge part of Persona Q, and it’s a lot of fun. The dungeons can be maddening in their complexity, but the mapping tools make it relatively easy to keep track of where you are, have been, and should be going. The maps also play a huge role in puzzle-solving. You’ll find yourself writing down notes, plotting out precise enemy movements, and feeling generally overwhelmed. It’s a lot to take in, but it’s a much richer dungeon-crawling experience as a result. For those who want to make things a bit less hectic, there’s an auto-mapping option that handles more of the process for you. The single, shining disappointment of Persona Q is right there in the title: persona fusion. Atlus nailed this stuff thoroughly in Shin Megami Tensei IV, and I can only hope those fusion mechanics will be present in Persona 5. Persona Q‘s version is severely stunted and simplified, but not in a way that suits the demands of the game. Interacting with this part of the game was such a drag that I found myself avoiding the Velvet Room altogether. Speaking of Shin Megami Tensei IV, it would be apropos to recall my review of that game: I just can’t stay mad at Persona Q. And it did make me mad, frequently. The weaker character moments, the mounting dungeon difficulties, and the scaled-back fusion interface would be damning offenses in another game. The miracle of Atlus’ JRPG renaissance is that they’ve struck upon a certain chemical reaction that chews through my finely honed, cynical defenses. My eyes were misty by the end of Persona Q, which, trust me, doesn’t happen often. The story of Zen, Rei, and why all these characters I love have to work together is obviously something I cannot spoil. But believe me when I tell you that what it has to say about relationships, theology, and, yes, fan service, is the reason I cannot stop thinking about Persona Q.
Persona Q is not the post-modern morality opera of Shin Megami Tensei IV. It is not the subtle, darkening burn of Persona 3. It is not the perfection of Persona 4: Golden. Persona Q is flawed, and intimate, and only itself. It is a game about big emotions, and stories, and why we hang around long after we should have gone. Atlus seems to think I should move on, but if they keep making games as heartbreakingly excellent as Persona Q: Shadow of the Labyrinth, then I don’t think I ever will.